Beehive Temperature: What is the Ideal Temperature for Bees and Honey? Can A Beehive Get Too Hot or Too cold? Beehive temperature is really critical to good honey and bee health no matter where the hive is located. 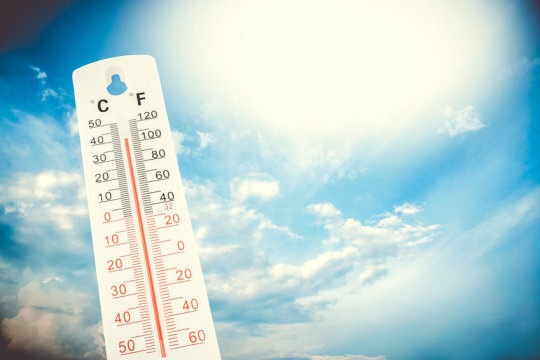 In North America, temperatures throughout the year can soar as high as 115° F (46 °C) and as low as 40° F below zero (-40° C). These temperature extremes can kill bees and decrease honey production or quality. Just like in the fairy tale “Goldilocks and the Three Bears”, bees have an exact preference for temperature in the hive. During periods of excessive heat or an abundance of nectar, the bees beat their wings to renew the hive’s atmosphere. Ventilation is at the center of honey making. The foragers pass on the nectar gathered from the flowers into the mouths of other worker bees, who then store it in the hive’s cells. This nectar is dehydrated by the movement of the air produced by the fanning bees wings. It becomes honey when the moisture content reaches 17%. Beehives need to be kept at 95° F to be the right temperature to produce honey. If the temperature becomes hotter than 95 degrees the bees will station themselves throughout the hive and fan their wings. There will be many on the bottom board, the board they land on when the bees fly home, fanning their wings. It is amazing because the bees will provide enough ventilation to keep the temperature in the hive at 95° F. If the brood, the baby bees, get hotter than 95° they will die. The temperature that the bees keep the hive is also the is also the perfect temperature to rear brood, the baby bees. If the brood temperature gets below 95 degrees it will die. If the weather turns cold, the bees will cluster over the brood in the frame to keep the brood at 95 degrees, even if the temperature is -40° F. The bees on the inside of the cluster will move toward the outside of the cluster and the bees on the outside of the cluster will move toward the inside of the cluster. By moving their muscles, they produce heat. If you were to open a hive when the temperature was cold a frame would look like it had cellophane plastic over it because the bees overlap their wings, keeping the heat on the frame, thus warming the brood. If a beehive gets too hot, the bee brood dies and the honey gets dehydrated too quickly. If a beehive gets too cold, broods die off and the nectar cannot dehydrate fast enough to make honey. Ninety-five degrees is the exact right temperature for a hive.